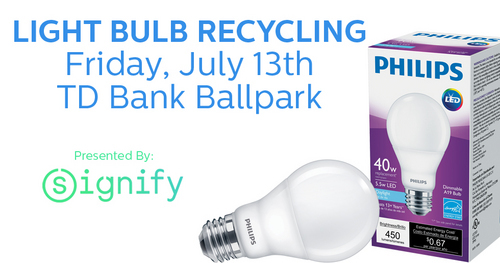 Bridgewater, NJ – The Somerset Patriots have teamed up with Signify, home to the Philips lighting brand, to host a light bulb recycling and free LED light giveaway event as part of the Friday, July 13th game at TD Bank Ballpark. The game starts at 7:05 pm against the Lancaster Barnstormers and will also feature a fireworks show, presented by Signify. As part of its Brighter Lives, Better World sustainability program, Signify, the world leader in lighting, will give a free, energy-efficient LED light bulb to all fans attending the game. To help save even more on their home energy costs, fans can receive an additional LED bulb by trading in an incandescent light bulb or compact fluorescent lamp (CFL), which Signify will collect and recycle. Switching to LED lighting can result in significant energy and cost savings. Some of Philips LEDs use up to 90 percent less energy than traditional light bulbs. LED light bulbs also come with an exceptionally long lifetime when compared to traditional light bulbs, capable of lasting 20+ years depending on use. Philips LEDs are also designed to meet our specific quality criteria, so they are comfortable for your eyes.